Joe’s is promoting and donating to the work of Farm to Restaurant. F2R is a specific program, under the umbrella of the well-known Farm to Table organization. F2R facilitates local food sourcing between Santa Fe restaurants and local growers and educates the public about the benefits of eating locally grown. This reinforces the critical link between our local growers and the vibrant health (on many levels) of our Northern NM community. And how can you help? 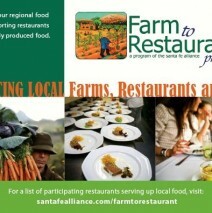 We are planning a Farm to Restaurant Charitable Prix Fixe event. All throughout June we will offer a prix fixe meal for two for 49.00 starting at 11AM daily. 10% of these sales will then be donated to F2R. So feel free to spend more than the bargain price of 49.00 for two!! You and your dining companion will choose any one appetizer, any two entrees and any one dessert from any of our menus (from our regular menu or from “daily specials” menu.) We are intending to send a nice chunk of cash to this worthy program, so think about how this can fit into your dining choices for June. And many thanks in advance from all of us at Joe’s. large pizza counts as 2 entrees, for the Full Rack of Lamb please add $8.00.